To many PDA users, there are only two choices for a light, compact, and functional keyboard: the Stowaway, and the GoType. I think we all know which of the two is winning the keyboard "battle", for now. 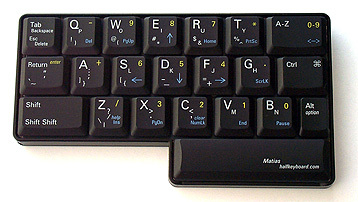 But there is another keyboard on the market that not too many people know about, the Matias HalfKeyboard. 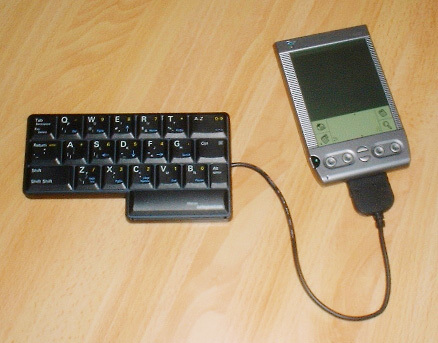 I first saw the HalfKeyboard in a CNET article awhile ago. I was totally blown away by its looks. I had to find out more about this amazing device, hence, this review. This beautifully designed product came in a black case. As I opened the case, I was stunned to see how small it really was. It seemed much smaller than in the pictures on the website, yet the keys are full size, high quality laptop-like keys. This keyboard is indeed high quality. I've tried dropping it, attaching it and detaching it, and as I sit in the blazing sun here on the UW campus, it's holding up to the heat very well. The HalfKeyboard is a well thought out typing machine. It measures 5.25" wide by 3.25" by 0.56" thick (at it's thickest point). There is a 9" cord that wraps around and folds into the sides of the HalfKeyboard for quick storage, and little rubber pieces on the bottom to keep it from slipping. You simply toss the floppy disk it comes with into your computer to install the driver, and plug the keyboard into your Visor. The connection between the keyboard and the Visor works like a dream. It's a very smooth and simple transition from no keyboard to a HalfKeyboard!